The first chapter is introductory. It presents some of the basic notions of our subject, it assembles some of the tools and techniques that will be used throughout the text, and it presents some examples. 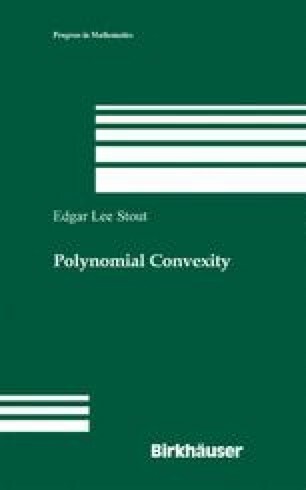 Section 1.1 introduces the notion of polynomial convexity and the related notion of rational convexity. Section 1.2 is an introduction to the abstract theory of uniform algebras. Section 1.3 summarizes some parts of the theory of plurisubharmonic functions. Section 1.4 is devoted to the Cauchy-Fantappiè integral, a very general integral formula in the setting of the theory of functions of several complex variables, whether on ℂN or on complex manifolds. Section 1.5 contains a proof of the Oka-Weil approximation theorem based on the Cauchy-Fantappiè formula. Section 1.6 presents several examples, some of which indicate the pathology of the subject, others of which are results that will find application in the sequel. Section 1.7 gives an example of a hull with no analytic structure.